Hey, Pete. What are your thoughts on the BREXIT? anyone mind to share opinion or comment? Target would be the lower part of the purple box which is 50-61.8 fib retracement from highest to bottom of the price action from the chart. Edit: the chart is EurUsd. Not much. Didn’t trade. I like repetition, not these type of events. Just to add to the thread, my most recent trade. 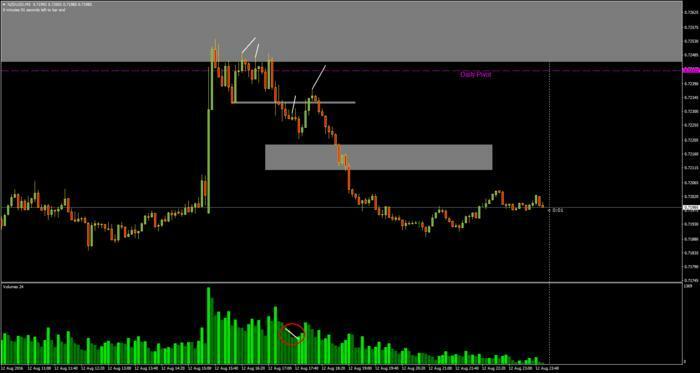 NZD came into a 50 - 61.8 fib zone, highlighted at the top with extremely high volume. AR formed within 30 minutes, showing a few ND before breaking to the downside on medium volume. A period of low volume testing, before showing a few more ND. Any thoughts on improving my odds with this break-test pattern would be appreciated. Thanks. What’s up guys ?how’s trading going? 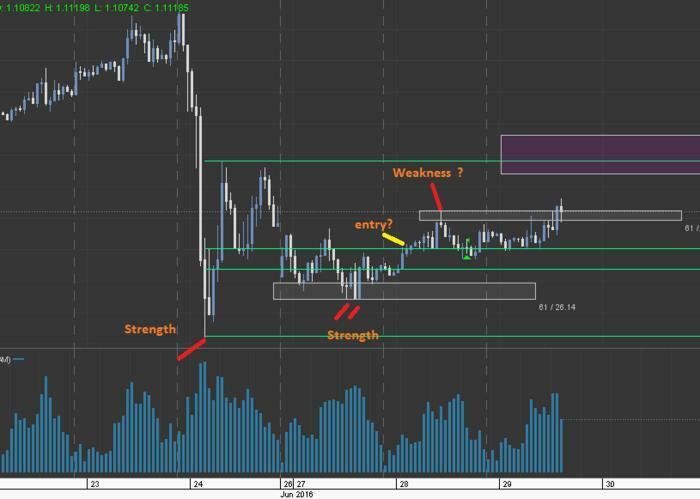 one question regarding the GBP/USD trade you took in the video yesterday. Is there a reason or rule to take the entry directly on the no demand without waiting for an automatic rally to form? 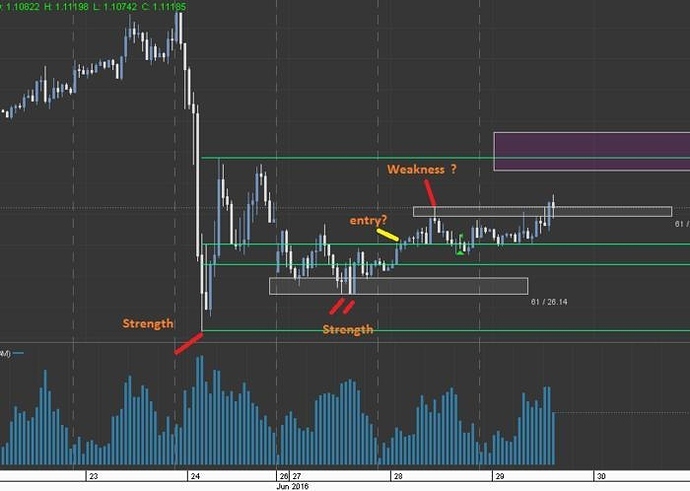 The Automatic Rally/support is not something that is needed to get into a trade. If it does form, we use it going forward, but it may not. To explain a bit more. Imagine if the 14 ema test did show buyers, and instead of the ND there was demand and it sent price back up…then going forward we would have that support as our AR. Sometimes the market is so out of balance there is not enough activity (in this case no buyers) for it to form. Thanks for the quick response. Does it mean (for shorts) in case a ND is formed above the 14 EMA a break with relative low volme of the 14 EMA is your confirmation with a stop above the top where weakness occured? Would be great if you explain your entry possibilities in detail during your “Basics of my trading mthods explained” series. Haha, yes big problem. In the example you gave of a ND before testing the 14, the entry below that ND is valid. Over time I’ve really started to wait for the 14 break in almost every situation…so yes I would enter the trade as you described. There are a handful of variations for entry, but they should all be logical. Yes, I will make another video very soon. I was thinking of clarifying this “test” stuff next anyway. I was wondering if anyone could help me. I’m new to this and currently using Fxpro for volume data on MT4 is there a more reliable volume data company I could use instead. Does anyone in here use fxpro. Pete i’d love to here your thoughts on this also? Loving the enthusiasm and optimism. It’s great to come across an established thread (albeit continued) and strategy that is still going after a few years. Thanks Pete for your hard work and dedication. I’m really keen to embrace your understanding of VSA and look forward to ploughing through the countless videos and posted literature as well as signing up to your training room. I’m not a complete novice as I have spend the last week going through your youtube video archive and, although slowly, things are falling into place. I have a few questions I’d like to ask if you don’t mind before jump in full time and sign up to the trading room. Trade Frequency - On average, I say on average because of course it depends on how the markets behave, but based upon your last 12 months of trading, how many trades a week/month can I expect to be taking? Expected Return - I wouldn’t embarrass anyone by asking how much money they make so taking percentages, what kind of % return are you making on a weekly/monthly basis. Again, averaging the results. Drawdown - My understanding is that Drawdown is the biggest consideration for any trader. Again, talking percentages, what is the relative and absolute Drawdown have you experienced ? Any advice on how to handle the US elections? Simply not trade on November 8/9? Do you have any experience with past elections? Are the markets usually quiet so that there is no reason to trade or are they as volatile as always? what are you using for a source of volume these days? hello there guys, is anyone still trading with Pete? or with his way of dealing with the volume at all? I am a completely new trader and looking for my first trading system. This system looks strange to me, but judging from the comment of others, it seem to be a good one. How do I understand this system and where do I start from?